YOU KILLED ME FIRST at KW Institute of Contemporary Art in Berlin is the first exhibition on the Cinema of Transgression. The films are being displayed as an installation, and many of the key players from the movement will be making appearances, leading talks and discussions. 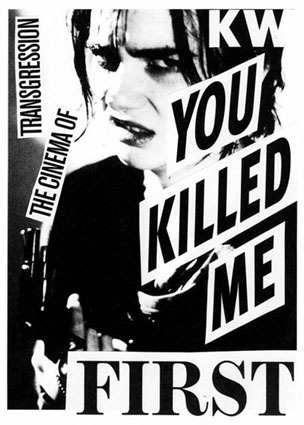 The “Cinema of Transgression” a term coined by Nick Zedd, describes a loose congregation of filmmakers in New York’s Lower East Side in the 1980′s, including Zedd, Richard Kern, Cassandra Stark and Tommy Turner. JG Thirlwell scored many of Kern’s films, as well as contributing to the films of Turner and Stark.